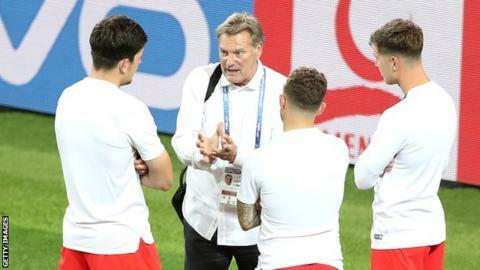 Former England and Tottenham manager Glenn Hoddle is seriously ill and has been taken to hospital after appearing as a pundit on BT Sport on Saturday. Presenter Mark Pougatch said the football results show BT Score had been cancelled as a result of Hoddle's condition. The illness occurred on the former Spurs midfielder's 61st birthday. BT presenter Jake Humphrey said Hoddle was "taken seriously ill at the BT Sport studio this morning". He added on social media: "Everyone of us is right with you Glenn, sending love and strength." Hoddle, who earned 53 caps for England and was a star midfielder for Tottenham, was considered to be one of the best players of his generation. He won the FA Cup and Uefa Cup with Spurs and also played for Monaco, Swindon and Chelsea. Former Tottenham and England striker Gary Lineker said: "Hugely worrying news that Glenn Hoddle collapsed at the BT studios earlier. Thoughts are with him and his family. Come on Glenn".